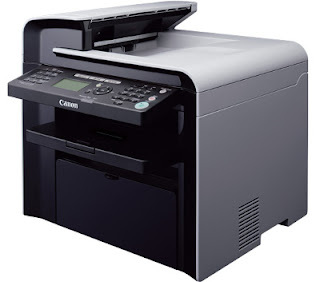 Canon i-SENSYS MF4550d Driver Download. The Canon i-sensys MF4550d printer is identical to the MF4570dn, the network less. The base remains exactly the same. I will therefore have exactly the same quality of printing on the two products, the same cost per page (they are the same cartridges) and, the same throughput. So what changes? Ergonomics: Canon's promise is to offer a compact, fast and energy efficient model for small offices. This Canon i-SENSYS MF4550d 4-in-1 monochrome laser, is intended for small workgroups or for personal use. Printing, copying, scanning and faxing, all in double-sided if desired, are on the program. On the other hand, it is not compatible network which can possibly present a discomfort for a professional use. They are similar to those of the MF4570dn. From the entry-level to the most advanced model, the cartridges and engine are the same. The Canon i-sensys MF4570dn printer is a reactive, wake-up and fast-speed printer. However, the quality will not suit the most demanding, and the cost per page remains too high for big printing needs. In the driver installation Canon does not stick to the (admittedly high) standards of Apple. One misses the "Apple feeling" during the installation. The information on the manufacturers page is somewhat confusing. Canon i-SENSYS MF4550d driver installation with tricks and little meaningful error messages; 1. left: Problems with Mac OS X: If you go to the Canon page to search for the driver for Mac OS X 10.6, you are faced with the following problems. 2. Center and right: Driver problems with Windows 7: If you want to install the Windows driver from the supplied CD, but has a 64bit operating system, you get this cryptic error message. A note in the manual tells the user that the 64-bit Windows driver is to be downloaded from the Canon page. The Canon i-SENSYS MF4550d driver is according to the Canon page for Mac OSX versions up to 10.6.5. Although I have 10.6.8., But I am not impressed. After agreeing to the license agreement and the disclaimer, I can download the driver for Mac OS X. It comes as a zip file: "o1141dex_m_ufr224.zip". After unpacking, I can install the installation file "UFR II Installer.mpgk" by double-clicking it and clicking through the installation dialog. If I have installed the printer driver successfully, I can add the printer in the system settings as a new printer. I can select the printer driver "Canon MF4500 Series (DE)" from the drop-down list. With the fax, which is displayed as a separate printer, I do the same.